Yes, definitely 🙂 So much to be thankful for each day! Thanks for following my blog. You are a blessing. You are very welcome. Please have a wonderful day. I used to have tons and tons of affirmations. I’m happy wealthy healthy. Does wealthy mean rich with lots of money? it can be subjective depending on how you define wealth. Stay positive!!! Lol. Sure follow me also. What ask more ? This is neautiful to say we are blessed . I am very glad to know that you feel the love of others. That is a wonderful feeling. I am glad you hit the like button, nice to meet you – look forward to reading more of your posts. This is so inspiring, I love it! 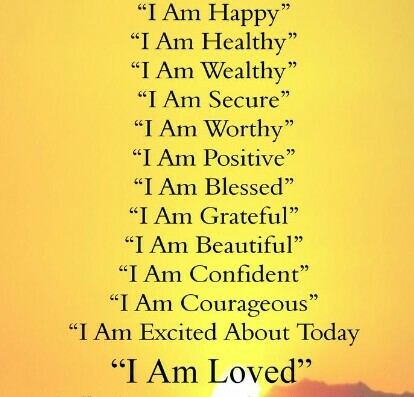 I find myself in every affirmation and the most beautiful one…”I am loved!” brought tears of gratitude in my eyes. Thank you! Thank you, also, for following my blog, I’m honored! Ah, no I’m honored. Your always welcome.